I had the opportunity to travel from my home in Paraguay to Suriname in order to establish monitoring sites for Manomet’s International Shorebird Survey. Suriname is on the northern edge of South America. With Guyana and French Guiana, Suriname is sandwiched between Venezuela to the west and Brazil out to the east. It was along this remote coast that the Canadian biologists Guy Morrison and Ken Ross encountered huge flocks of small sandpipers during their epic flight in small planes, circumnavigating the entire South American continent during the nineteen eighties.1 Ground surveys carried out by the ornithologist, Arie Spaans confirmed millions of Nearctic shorebirds using the extensive mudflats in this tropical paradise. These surveys led to the designation of the first WHSRN sites in South America, including Bigi Pan, Wia Wia and Coppenamemonding, all joining the network in March of 1989 as sites of Hemispheric importance. To understand both local and range-wide population trends, regular monitoring at many locations can help conservation biologists estimate shorebird numbers and determine where conservation efforts might have the greatest impact. Suriname, as important to shorebirds as it is, has not had a regular and widespread monitoring effort. 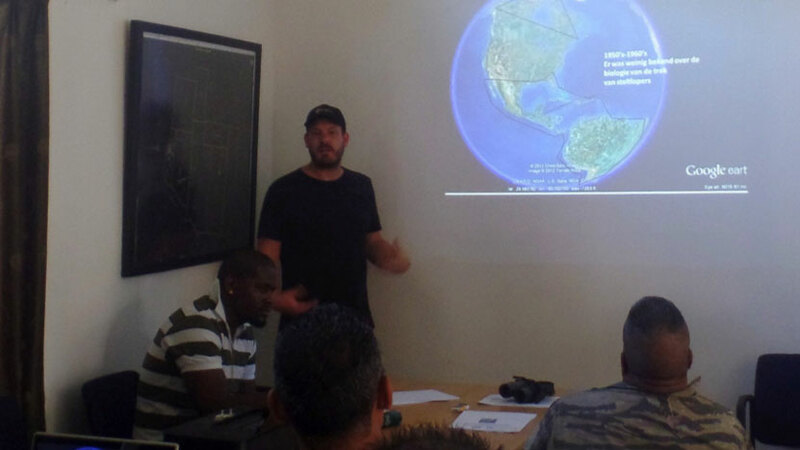 To address this regional gap in shorebird data, the Shorebird Recovery Program of Manomet planned an International Shorebird Survey (ISS) and Shorebird identification workshop on the Suriname Coast in early December. I conducted that effort, working to get more shorebird enthusiasts and professional biologists engaged in gathering data for Manomet. Unfortunately, numbers of many Nearctic shorebird populations have declined since those surveys in the ‘80s. The decline in wintering shorebirds along the coast of Suriname has been reported in several published papers.2,3 Semipalmated Sandpipers and Lesser Yellowlegs populations have plummeted significantly, and it is believed that unregulated hunting along the migration routes through the Lesser Antilles and on their winter grounds of South America is the primary cause of these declines. The workshop was organized and hosted by the Forest Management Division of the Ministry of Physical Planning, Land- and Forestry Management, with help from Marie Djosetro. Marie attended a shorebird workshop in Icapui Brazil last spring and hosted a WHSRN site assessment tool workshop in 2014. The agenda was prepared by Assistant Director of Forest Management Mr. O. Saeroon and his team and the whole event was of the most adventurous kind. I did not know what to expect when I landed, but anticipated spending most of my time lecturing indoors. 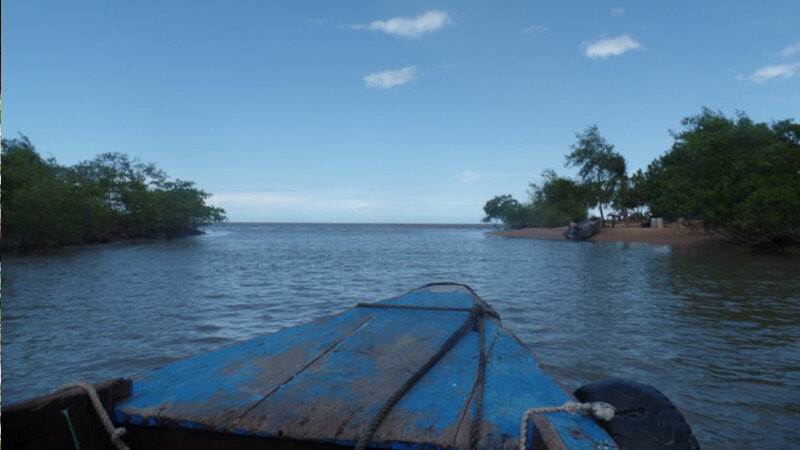 However, instead of sitting for two days in a classroom talking about shorebirds, I quickly found himself on one of two small heavily loaded boats, zipping along intertidal mangrove creeks and rivers on the way to a small town on the rugged coast. I was in the company of all 20 workshop participants, including tour guides, students, gamekeepers, former hunters, and staff of the Forestry Management Division. We had all of the provisions with us for what was becoming quite an expedition in to the wildlife-rich Surinamese wilderness. After some time on the water, we landed in a small coastal village where we spent the first night. The town is called Alliance, and not long after arriving, evening presentations were given on nature policy (M. Djosetro), environmental laws in Suriname (R. Ho Tsoi), shorebirds in Suriname (M. Lingaard) and Manomet´s shorebird work (me). Ecology at Manomet’s International Shorebird Survey Workshop in Alliance, Suriname. 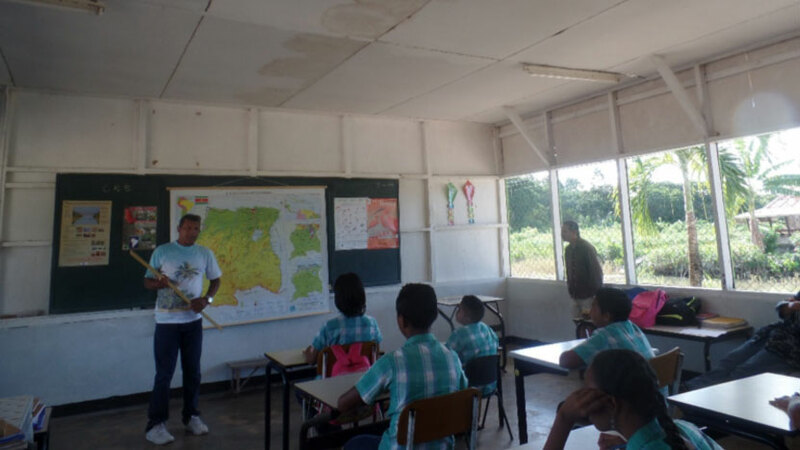 Mr. A. Pherai (Chief Education and Awareness of the National Forest Service) educating schoolchildren about shorebirds at the local school in Alliance. During the morning of day 2, I presented on Shorebird Identification, the need for shorebird data from Suriname and on how to become an International Shorebird Survey volunteer. Also, the local school was visited where schoolchildren were educated about Nearctic shorebirds and how the birds are threatened by hunting. 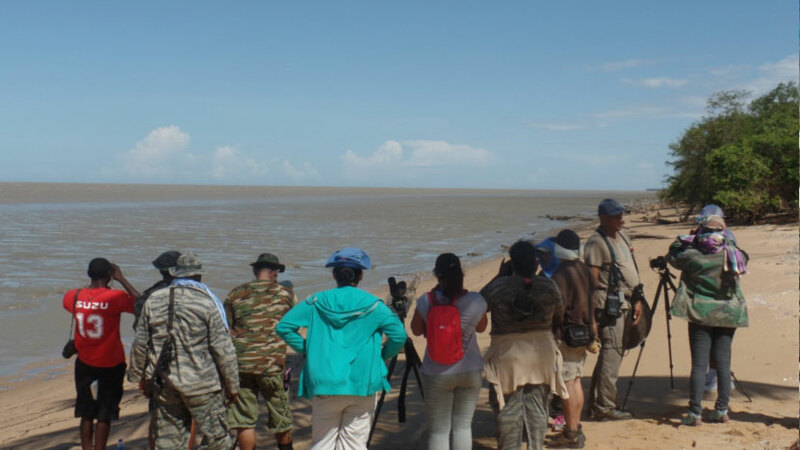 Consequently, the whole group had to prepare quickly as the next stop would be the Warappa Creek mouth, an important shorebird site along the Suriname Coast. The site can only be reached by water and only within a short timeframe between low and high tide. This narrow timeframe is because during high tide the water level in the Warappa Creek is too high and boats can’t get through because of overhanging vegetation, and the passage is impossible during low tide because the creek is too shallow for the boats to get through. 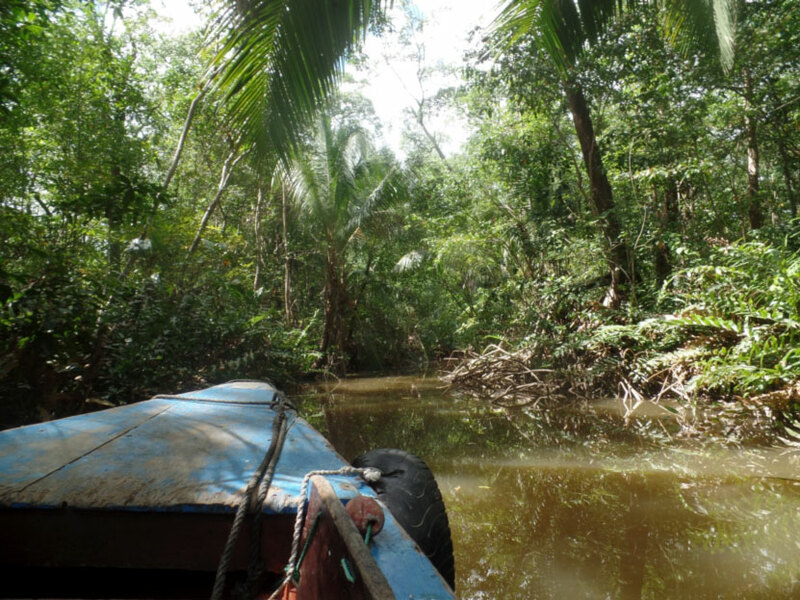 The one hour trip to the creek mouth was a great experience, navigating through a wall of forest on both sides of us, and with remnants of Suriname´s Colonial past in evidence. The area was used for sugarcane plantations during the years of Dutch occupation, which ended in 1975 with Suriname’s independence. 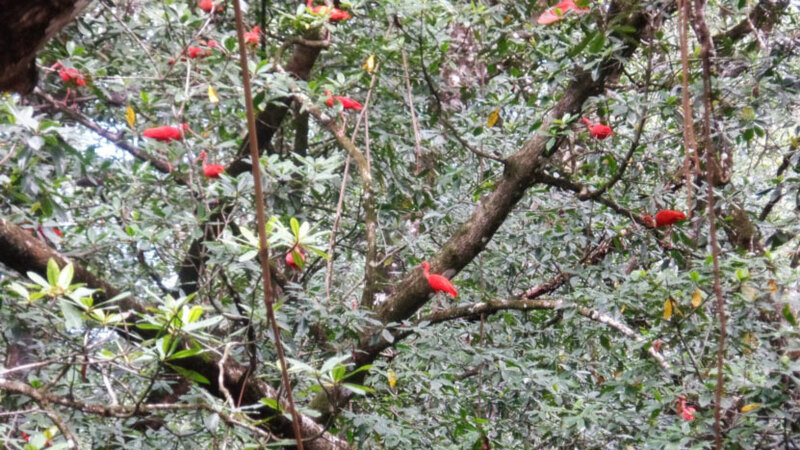 Flocks of very brightly colored Scarlet Ibis, sharply contrasting with the green vegetation, were frequently flushed from their roosts in the trees. It was an impressive and memorable sight each time we flushed them. Scarlet Ibis flocks along the Warappa Creek. Warappa Creek mouth and basecamp for remainder of the workshop in Suriname. After an hour both boats arrived at the Warappa Creek mouth, where basecamp was already prepared by Forest Management staff that traveled ahead the day before. The workshop fieldtrip turned out to be more than just a morning or day trip to the field. The night was spent here with the whole group, sleeping in hammocks and stretchers on the beach under the stars. During the afternoon and the morning of day 3, shorebirds were observed and identified with the group. A total of 13 species were found, including many Semipalmated Sandpipers, Black-bellied Plovers, Greater and Lesser Yellowlegs, Ruddy Turnstones, Sanderlings and Spotted Sandpipers. Also some Semipalmated Plovers, Willets, Whimbrels, Red Knots, Least Sandpipers and Short-billed Dowitchers were seen. Overall, a great variety of shorebirds to show to the workshop participants, who were quickly able to start recognizing the subtle differences between some of the most difficult species to identify. Warappa Creek mouth mudflats, full of the invertebrate prey of thousands of shorebirds. 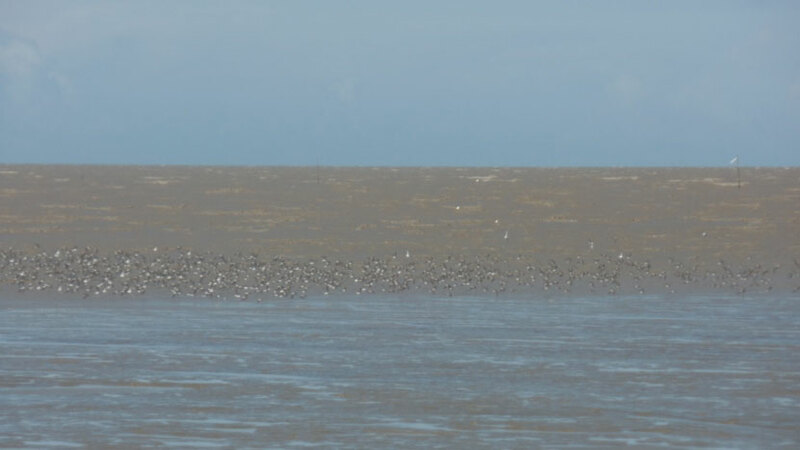 A nice flock of Semipalmated Sandpipers feed on the incoming tide. The silts that form these flats are the product of the mighty Amazon River flowing into the Atlantic from Brazil, far to our east. 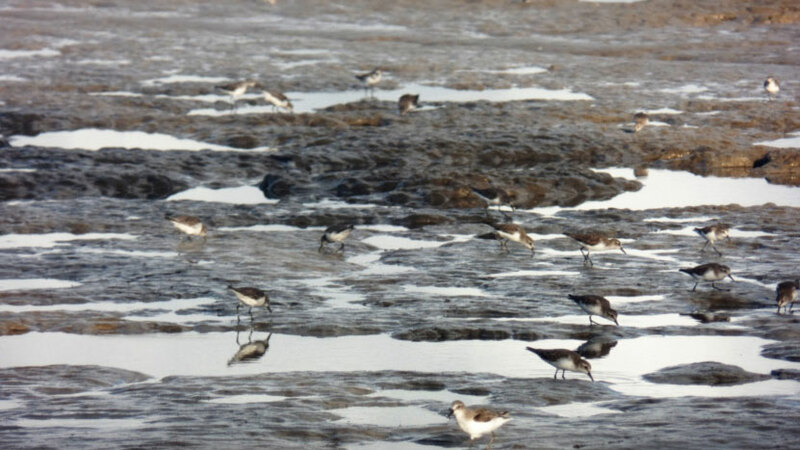 Feeding Semipalmated Sandpipers on Warappa Creek mouth mudflats. Some of these birds might have been seen by Manomet Staff working on Coats Island all the way up in Hudson Bay, Nunavut Canada. Here we are practicing shorebird identification, and estimating the flock-size of the Semipalmated Sandpipers. (Photo M. Djosetro). Workshop participants (Photo M. Djosetro). The workshop ended with an evaluation on the beach during which all participants could have their say. All enjoyed the experience and a number of the participants showed a lot of interest in becoming an ISS volunteer, including some of the park rangers. 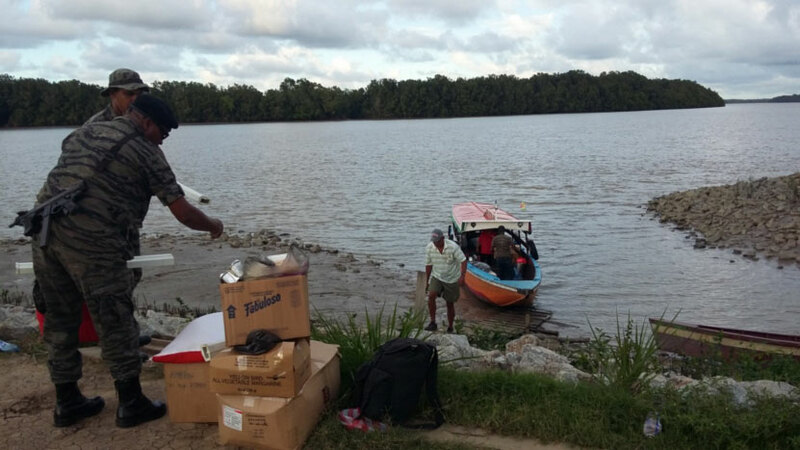 After the evaluation session, we had to pack quickly and be ready for the trip back to Paramaribo before the tide was too high and we would be stuck on the River mouth for another day. To me, the workshop was a great experience and, above all, a great success. Participants got excited about observing shorebirds and the challenge of identifying the species by picking out the little but clear difference between them. 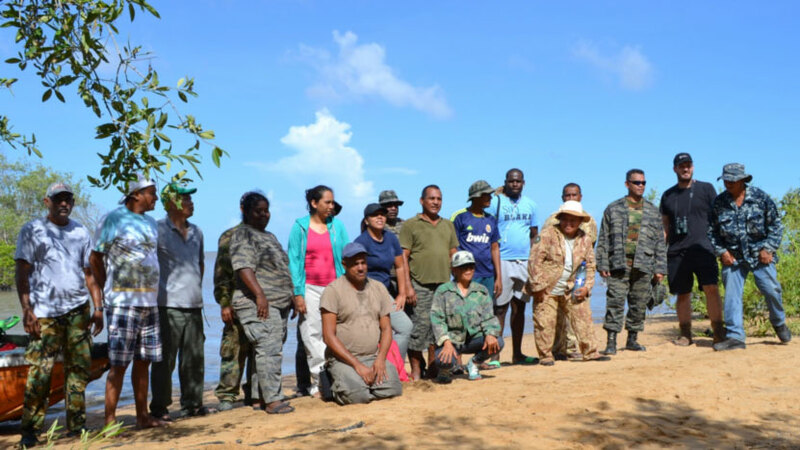 The Assistant Director of Forest Management Mr. O. Saeroon acknowledged the importance of the Suriname coast for staging and wintering shorebirds. 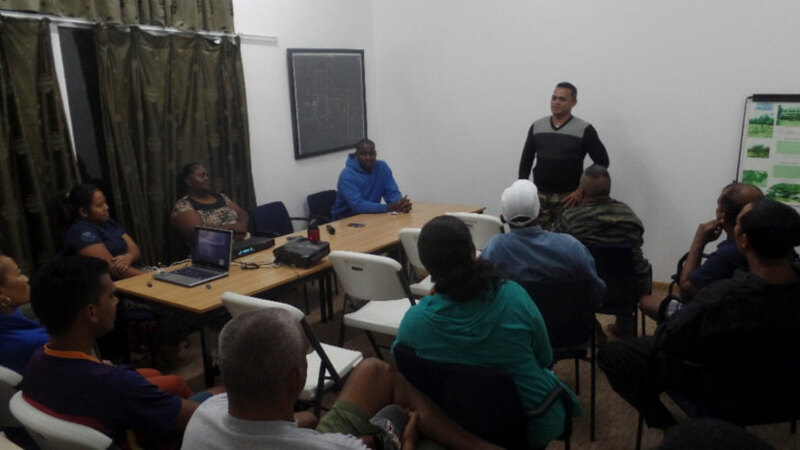 It was agreed to stay in contact and assist wherever necessary so that ISS is implemented again in Suriname. We would like to thank Mr. O. Saeroon, all his staff of the Forest Management Division, Marie Djosetro, and all participants for making this workshop happen, especially keeping in mind it was all on short notice. The logistics of the workshop went flawlessly and we hope we can come back someday for a follow up effort on behalf of the shorebirds, their habitat, and the people of Suriname. 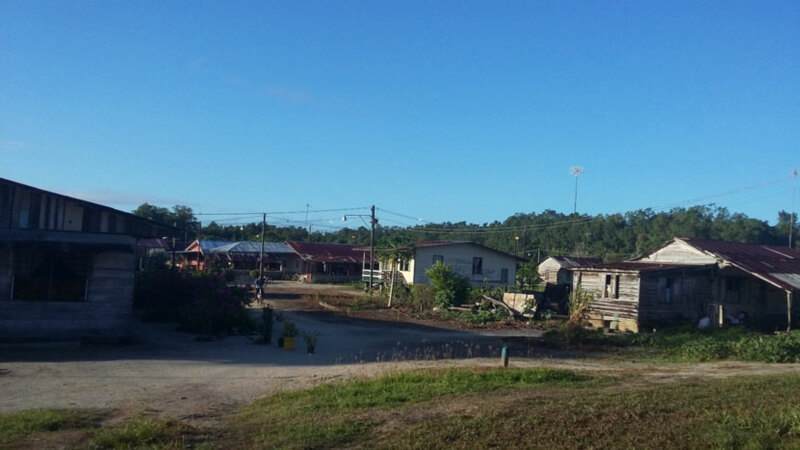 When leaving Suriname, I had a ten-hour layover at the airport of Port of Spain, Trinidad & Tobago. This could have been long and exhaustingly boring, but fortunately, I was picked up by Graham White and Martyn Kennefick, two board members of the Asa Wright Nature Centre and die-hard birders. Graham and Martyn took me to the Asa Wright Nature Centre to spend the day. So instead of biding my time in an airport, the day turned out to be a rewarding one, making new friends, seeing several “lifers” for my global bird list and sharing ideas for future Manomet work in the region. 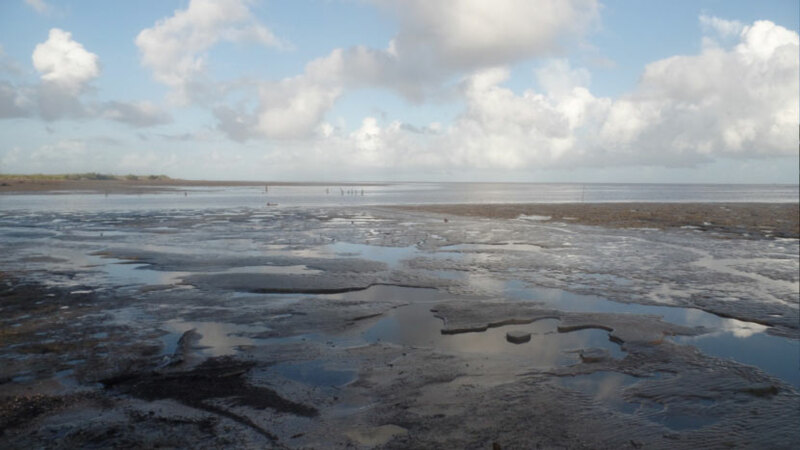 During our conversations, Graham and Martyn informed me that Trinidad has an important stopover site for shorebirds called the Westcoast Mudflats, but unfortunately only few people master the skills to monitor and identify shorebirds. In other words, an ISS workshop could be of great use for the country and the shorebirds of the Caribbean. Morrison, R. I. G. and R. K. Ross. 1989. Atlas of Nearctic shorebirds on the coast of South America. Canadian Wildlife Service Special Publication, Ottawa, Ontario. Morrison, G. D.S. Mizrahi, R.K. Ross, O.H. Ottem, N. dePracontal, A. Narine. 2012. Dramatic Declines of Semipalmated Sandpipers on their Major Wintering Areas in the Guianas, Northern South America. Waterbirds 35(1): 120-134.